This article presents the reconstruction of an Iron Age horse bridle, which was done at the Lofotr Viking Museum at Borg, Northern Norway, during June 2009. As a part of my master thesis on Iron Age horse gear and horse skeletal remains from Northern Norway, the results from this reconstruction project made an important contribution to the understanding and analysis of the archaeological material. The presented reconstruction is only one of several possible constructions and bridle types. The finds of Iron Age horse gear from Northern Norway consist almost without exception of bits, while other parts of the bridle, like leather straps, usually are not preserved. Two similar horse harness mounts, found at Borg and Ytre Elgsnes, are the only finds which can give information on how the Iron Age bridles may have been constructed, and how they acted on the horse (Bunse 2010). There has already been made several reconstructions of horse bridles with this specific type of harness mount (Arwidsson 1977: 57-58, Rech 2006: 56-57). Examining two of these reconstructions, it is argued that the emphasis has been on design and aesthetics, and not on obtaining the correct anatomical fit or action. Hence, the aim of the reconstruction presented in this article, was to combine the harness mount’s functional and decorative properties with anatomical fit and effectiveness. The reconstruction is based on a gilt bronze horse harness mount from Borg in Lofoten, found during a large research excavation in the 1980s (See Figure 1). The mount was found within the stable of ‘the Chieftains hall’ (longhouse I: 1a), a three-aisled longhouse with a length of 83 m, dated to the Merovingian and Viking periods (Munch et al. 2003). The mount measures 5.2 x 4.8 cm and is shaped like a step pyramid. In the middle, there is a small silver button, while the brink is covered by rhombic-shaped stamp decorations. The harness mount is of Ørsnes’ type 9D3, variant b, which dates to the Early Merovingian period, i.e. the second half of the seventh century AD (Ørsnes 1993: 240). Harness mounts of this type are rare and can be considered luxury items. They are mostly known from Germany, but are also found in the Trøndelag region of Central Norway, in Bornholm, Denmark, and in Gotland, Sweden (Munch 2003: 242-243). Two replicas of this mount were cast by Ravn Forhistorisk Støbeteknik from Denmark, and made up the basis for the reconstruction. Some of the mounts similar to the Borg find, as those from Beckum in Germany and Valsgärde in Sweden, have been found with associated leather straps and other parts of the horse harness. The context of these finds indicate that the harness mounts were used in pairs and placed on both sides of the horse’s brow, where they kept together the bridle’s headpiece, browband and throatlash (See Figure 2). But still, the finds reveal no exact information on the fitting of the mounts and the position of the throatlash. One reconstruction, made by Gary Waidson at the Lofotr Viking Museum, is similar to a German reconstruction based on the finds from grave 17 at Beckum (Rech 2006: 56-57). 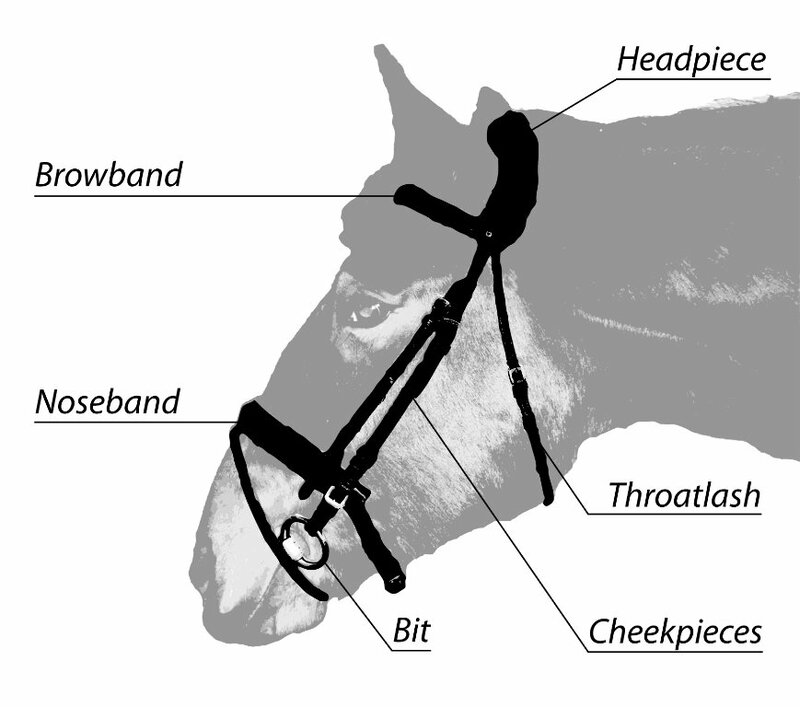 Two of the mount’s endings are placed on the bridle’s headpiece, while the other two are fitted on the browband and the throatlash (See Figure 3). From an aesthetic viewpoint, this seems to be a reasonable reconstruction of the original bridle. However, the horse’s breathing is likely to be constrained by the high, tight-fitted position of the throatlash (See Figure 4). To avoid this effect, the throatlash on modern bridles is loosely fitted in a lower position around the horse’s cheek (See Figure 2). Moreover, the throatlash on Waidson’s reconstruction was worn out after only a brief period, since the mount bent it in an unfavourable position. Another reconstruction, which is based on the finds from grave 7 at Valsgärde, Sweden, seems to fit better to the horse’s anatomy (Arwidsson 1977: 57-58). At Valsgärde, the mounts were found together with two iron crosses which were placed on the back of the mounts, instead of single riveted plates for each of the mount’s four rivets (See Figure 5). The design of the crosses indicates that the mounts’ endings were not placed on the straps, but that the straps were lodged between the mounts and the crosses. 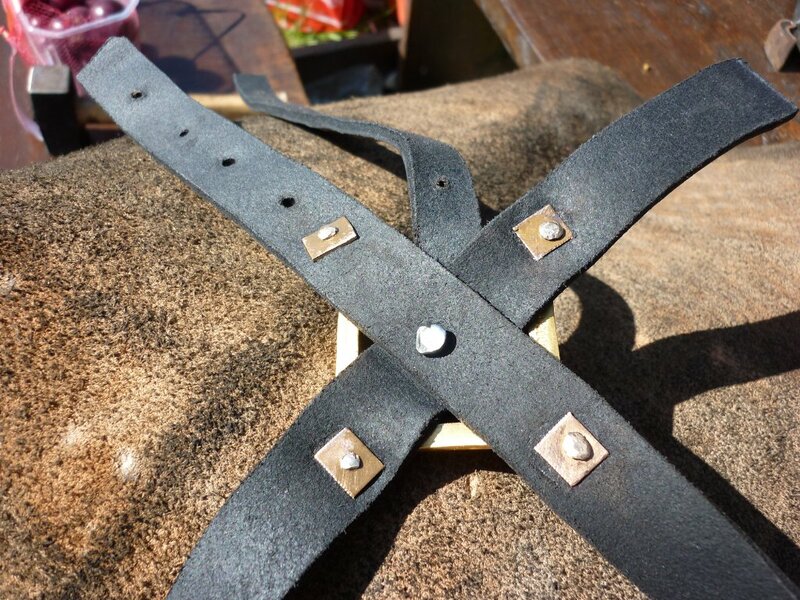 In addition, a strong iron rivet on the back of each cross kept together the straps, which were the bridle’s headpiece, the browband and the throatlash (See Figure 6). Some leather fragments, which were found together with the mounts and iron crosses, support this interpretation (Arwidsson 1997: 58). With the mounts fitted this way, the throatlash is placed in a lower position similar to the throatlash on modern bridles. Since the harness mount was the only preserved part of the Borg bridle, it was necessary to consider the evidence from other more complete finds. Most of the harness mounts of this type have been found without iron crosses of the Valsgärde type on the back. It was therefore considered to be more in agreement with the archaeological material to omit this particular feature in the reconstruction. The mount’s four endings were placed on the straps, with two endings fitted on the headpiece, one on the browband and one on a decorative extension of the browband. 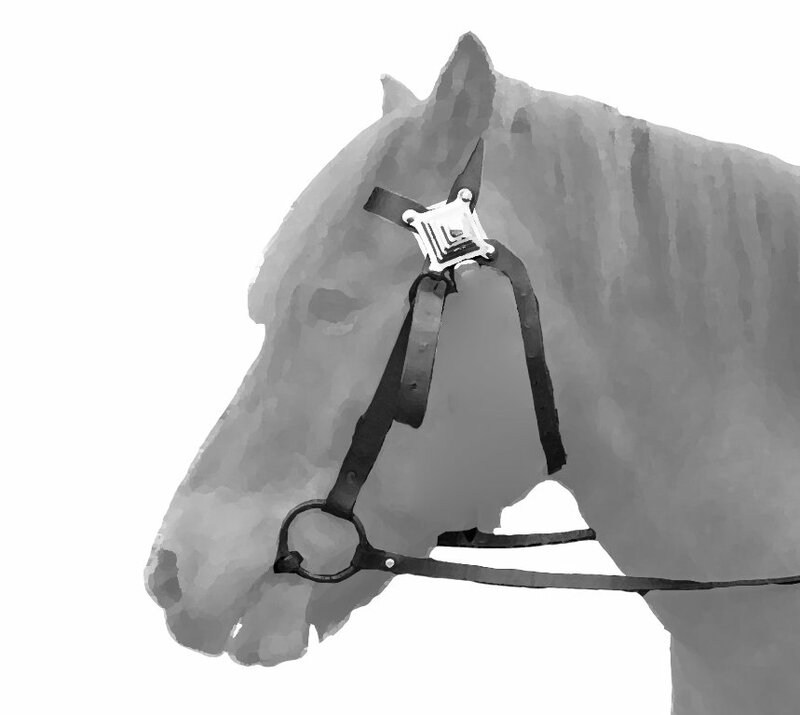 The throatlash was then joined together with the headpiece and browband by a strong iron rivet on the back of the harness mount (See Figure 7). Thus, the throatlash was fit in a way that would not constrain the horse’s breathing, but still fulfil the purpose of keeping the bridle in place (See Figure 8). On this reconstruction, the harness mount has both a practical and decorative effect, as it keeps together the essential parts of the bridle, and at the same covers the crossing of the straps and the iron rivet. This interpretation is supported by marks of wear on the original mount’s rivet holes, which are evidence of the forces that exerted on the mount. Once the rider applies rein pressure, the part of the bridle, which is held together by the harness mount, will be strained. The so-called hand or rein aids apply pressure not only onto the bit, but via the bridle, also on the horse’s poll (Edwards 2004: 50-55). When a noseband is used, the rein aids may also act on the horse’s nose. But because of the bit type used for the reconstruction, the bridle was designed without a noseband. 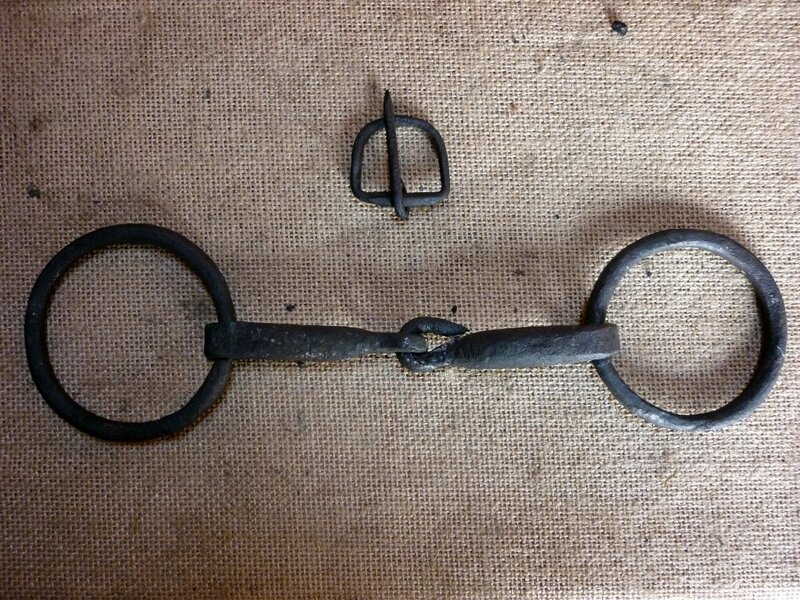 The bit, which was made by smith Jimmy Lian, was a loose-ring single-jointed snaffle with large rings (See Figure 9). This is a common bit type in the Iron Age material from Northern Norway (Bunse 2010). The dimensions of the reconstructed bit were based on the average measurements of all known Northern Norwegian finds. Thus, the rings had a thickness of approximately 0.8 cm and were about 6.5 cm in diameter, while the mouthpiece had a thickness of 1 cm and a length of ca. 12.5 cm. The large dimensions of the rings would have required a high fitting of the noseband. Placed in this way, the noseband would lose its main purpose, which is to keep the horse’s mouth closed and make the bit more effective. 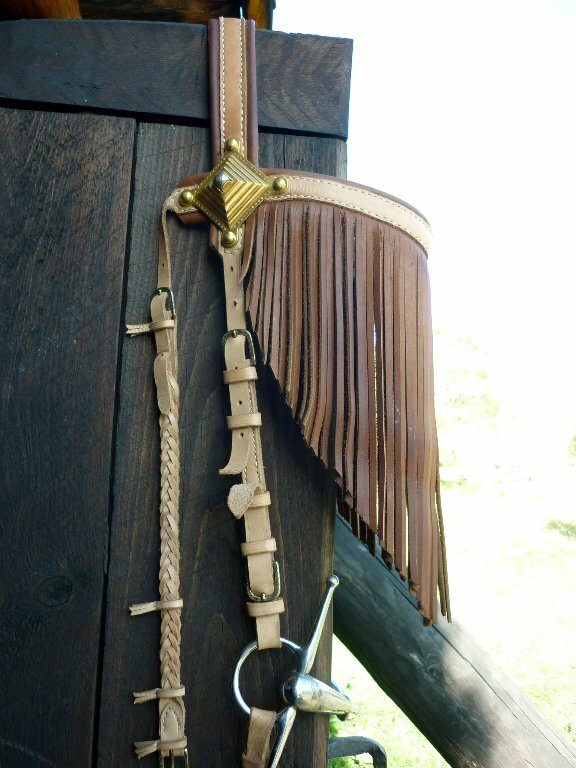 Furthermore, the need for a noseband also depends on the bit, which in this case was regarded as fully functional even without the support of a noseband. 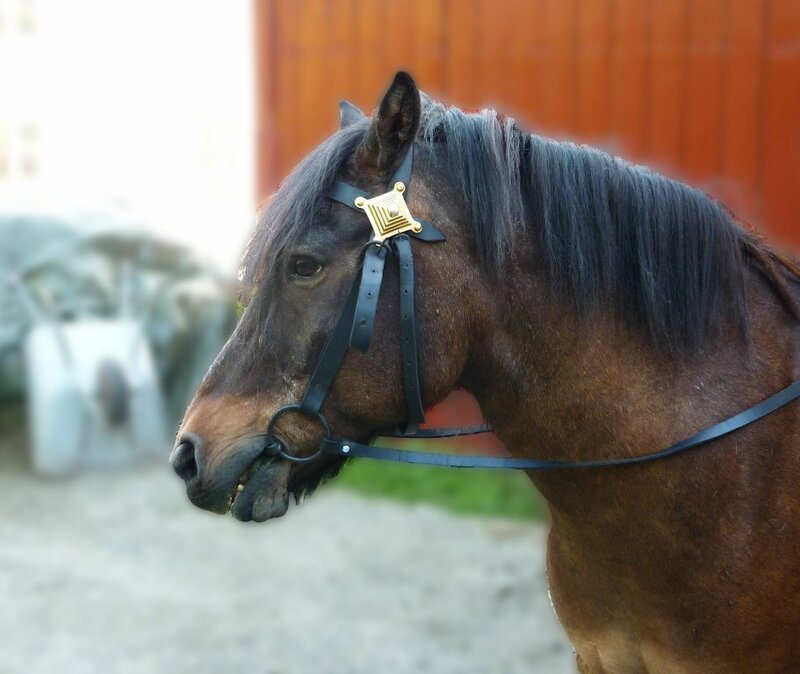 The bridle from Valsgärde was indeed reconstructed with a noseband. But since it only enclosed the nose and not the whole mouth, it mainly seems to have fulfilled a decorative purpose. Though, the mounts placed all over the strap could have increased its effect on the horse’s nose. As the finds from Beckum show, not all of the bridles with this type of harness mount have necessarily had a noseband. The size of the bridle is furthermore suited to the Northlands pony (Norwegian: nordlandshest or lyngshest), which is a breed likely to descend from Iron Age horses from Northern Norway (Bunse 2010: 3-6). Because of the riveted harness mounts, the freedoms of adjustment were limited for the reconstruction. To get at least a minimum of adjustment, iron buckles of Rygh’s type R.581 were mounted on the cheekpieces and the throatlash (Rygh 1885). After finishing the reconstruction, the bridle was tested on the Northlands pony Bruno. Both the length of the cheekpieces and the throatlash were adjusted with the buckles. However, the fixed size of the headpiece and browband was a little too large for the horse. There are considerable variations in size even among specimen of the same breed. Many of the Iron Age bridles, as the ones from Beckum and Valsgärde, seem to have been decorated with riveted mounts also on the cheek pieces, the browband and the noseband, thus limiting the freedoms of adjustment even further. Furthermore, the archaeological material from the late Iron Age in Scandinavia indicates that horses were highly prized status symbols. They were regarded as special animals that often followed their owner into the grave, or in some cases even got their own grave. 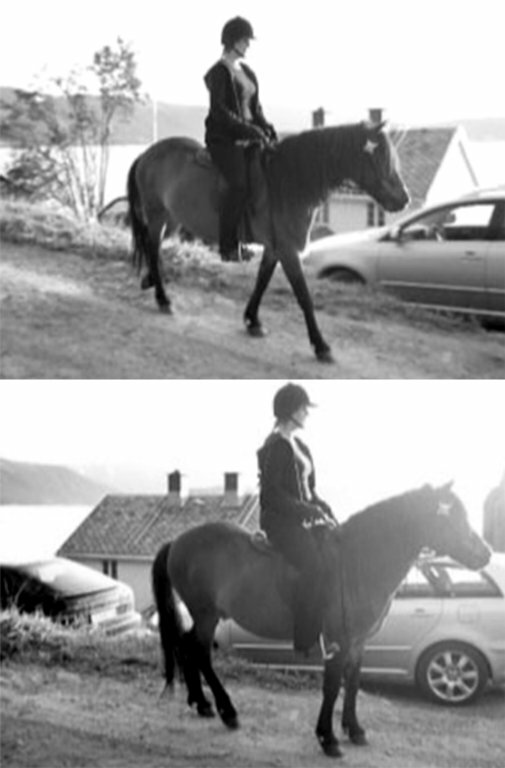 The horse harness was often deposited in the grave with the horse, something that indicates that horses could have had their own ‘personal’ equipment (Bunse 2010, Meling 2000, Oma 2000, Pétursdóttir 2007, Rech 2006). It is therefore more than likely that bridles with riveted harness mounts have been custom fitted to each horse. Compared to the bridle, the bit fit Bruno well. He was chewing on it, which showed that he accepted it and was ‘on the bit’. When chewing the bit, the horse will produce more saliva that greases the horse’s lips and the corners of the mouth, and thus prevents scratches and makes the bit more effective. How far the horse is willing to accept the bit does not only depend on the bit’s design, shape, weight and action, but also on the material it is made off. Bits containing ‘sweat’ materials like iron, copper or brass are usually more accepted than bits made of ‘tasteless’ stainless steel. Since the reconstructed bit was made of iron, the material was certainly part of the reason why it was accepted well. When assessing the bridle’s usability, one has to keep in mind that the bridle/bit only makes up one of many parts in the complex communication between horse and rider. The direction of the horse should never rely on rein or hand aids alone, but also on the interaction between rein/hand aids, leg aids and weight aids (Edwards 2004: 40). With this principle in mind, the bridle was tested in all gaits with regard to comfort and anatomical fit, control and steering of the horse, strength and functionality of the construction as a whole and, in particular, the harness mount. The design was solid and functional and did not cause any discomfort. No padding was applied on the back of the straps, but since the rivet heads were hammered flat, this did not interfere or harm the horse. The throatlash did not interfere the horse’s breathing even at extended physical strain in rough terrain or increased speed. The horse responded very well to the bit, even though the bridle was designed without a noseband. With the average thickness single-jointed mouthpiece, and the loose rings, the bit acts relatively mild to medium severe. A single-jointed mouthpiece has a ‘nutcracker’ action and squeezes the tongue when rein pressure is applied. However, it is often regarded as less severe than a mullen mouthpiece, since it provides more space for the tongue. The loose rings make the bit more mobile in the horse’s mouth, so that it can adjust to the moves of the horse’s head. Yet, the heavy weight of the reconstructed bit seemed to make it more severe than a modern lightweight bit, since it acted stronger on the bars. Thus, the horse responded with only light rein pressure applied. Since no strong rein tension was required, the forces acting on the harness mount were relatively low. However, the constant light rein contact and the horse’s chewing on the bit caused a light, but permanent strain on the mount. Thus, it can be assumed that long term use will cause marks of wear and tear on the mount and surely also on the leather straps. Yet, testing the functionality of the bridle and possible weaknesses with the construction would require a long-term test. Unfortunately, this could not be done within the limits of this project. The reconstruction presented in this article is based on a very limited number of finds, which in many cases are poorly preserved and which often cannot give information on the construction of the bridle. 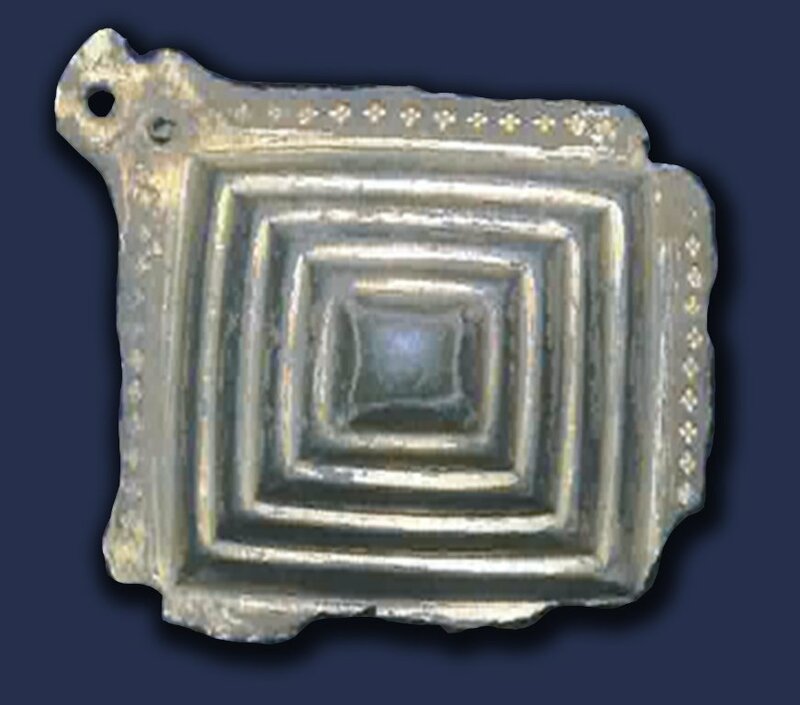 There are a number of different types of bits and harness mounts in the European and Scandinavian Iron Age material. The finds also indicate that there were several different ways to fit this certain type of harness mount to the bridle. Thus, the presented reconstruction is only one of several possible constructions and bridle types. However, the finds of this certain type of harness mount, as well as the bit type, are known from a large area which extends from Northern Norway over Central and Southern Scandinavia to Germany. Even though the harness mounts must be considered luxury items, bridles with this type of harness mount seem to have been one of the more common types within the elite society during the Early Merovingian period. Iron bits and riveted harness mounts can be considered as common parts of an Iron Age bridle. Hence, the reconstruction can vitally contribute to the understanding of construction and function of Iron Age horse bridles. The reconstructed bridle could successfully be tested in all gaits. It appeared to be functional and solid and did not cause any harm or discomfort. The horse responded well to the bridle and the bit, which both had a relatively mild to medium severe action. Even though no strong rein pressure was required, the light but permanent strain is assumed to cause marks of wear on the harness mount in a long term. The reconstructed bridle did not fit perfectly to the horse on which it was tested. Anyhow, the design fitted better to the horse’s anatomy than on some previous reconstructions. However, it was clearly shown that bridles with this type of harness mount must have been custom fitted to each horse. Thanks to Lars Erik Narmo and Lofotr Viking Museum, Jimmy Lian, Dan Halvard Løvli, Ken Ravn Hedegaard and Doreen Wehrhold for their help, support and contribution to the project. Im Juni 2009 wurde im Lofotr Viking Museum auf Borg in Nordnorwegen die Rekonstruktionen eines Zaumzeuges aus der Eisenzeit durchgeführt. Die Rekonstruktion basiert auf dem Fund eines Zaumzeugbeschlages aus vergoldeter Bronze, der bei der Ausgrabung eines Langhauses auf Borg zutage kam. Der Beschlag vom Typ Ørsnes 9D3,Variante b, datiert in die Merowingerzeit und ist vor allem in Deutschland, aber auch in Südostskandinavien und Mittelnorwegen verbreitet. Entsprechende Beschläge wurden paarweise verwendet und waren am Zaumzeug auf beiden Seiten der Stirn angebracht. Dort hielten sie das Kopfstück mit den Backenstücken, das Stirnband und möglicherweise auch den Kehlriemen zusammen. Zwei frühere Rekonstruktionen mit diesem Beschlagtypen scheinen mehr Wert auf die prunkvolle und ästhetische Gestaltung des Zaumzeuges gelegt zu haben, als auf dessen anatomische Passform und praktischen Zweck. In beiden Fällen wirkt besonders die Anbringung und Winkelung des Kehlriemens problematisch, da sie die Atmung des Pferdes behindern kann und in einem Fall zu frühem Verschleiß an diesem Riemen geführt hat. Deshalb war das Ziel der hier vorgestellten Rekonstruktion, die funktionellen und dekorativen Eigenschaften der Beschläge mit anatomisch korrektem Sitz und Funktionalität des Zaumzeuges zu vereinen. Der Rekonstruktionsprozess und der Test des fertigen Zaumzeuges sollten außerdem zu einem besseren Verständnis der Wirkung und Funktion des eisenzeitlichen Pferdegeschirrs beitragen. Das Zaumzeug wurde mit einem Nackenstück, welches auf beiden Seiten in die Backenstücke übergeht, einem Stirnband und Kehlriemen rekonstruiert. Die für die Rekonstruktion verwendete, einfach gebrochene Ringtrense mit großen Ringen, ist ein häufig vorkommender Typ im nordnorwegischen Material der jüngeren Eisenzeit. Das Zaumzeug wurde ohne Nasenriemen rekonstruiert, da die großen Trensenringe eine zu hohe Platzierung dieses Riemens erfordert hätten. Die Beschläge wurden mit jeweils einem Ende auf dem Nackenstück, einem Backenstück, dem Stirnband und einer dekorativen Verlängerung des Stirnbandes angebracht. Der Kehlriemen wurde auf der Rückseite der Beschläge mittels eines eisernen Niets mit den anderen Riemen verbunden. Die Beschläge verdecken die Riemenkreuzung und den Eisenniet und halten gleichzeitig die wesentlichen Bestandteile des Zaumzeuges zusammen. Verschleißspuren an den Nietlöchern des Originalbeschlages zeugen von den Kräften, die auf die Beschläge gewirkt haben müssen. Diese gehen mit großer Wahrscheinlichkeit auf die vermutete Platzierung der Beschläge an der Riemenkreuzung zwischen Nackenstück, Backenstück, Stirnband und Kehlriemen zurück. Durch die Zügelhilfen des Reiters wird diese Stelle relativ stark belastet, da der Zügelzug nicht nur über die Trense auf das Maul des Pferdes, sondern über das Zaumzeug auch auf das Genick wirkt. Das fertige Zaumzeug wurde an einem Nordlandpferd getestet. Ursprünglich sollte das Zaumzeug für mehrere Pferde genutzt werden, weshalb für die Größe ein Durchschnittsmaß mehrerer Nordlandpferde genommen wurde. Da jedoch die Größe selbst innerhalb einer Rasse stark variieren kann und das Einstellen aufgrund der vernieteten Beschläge nur bedingt möglich ist, war das Nackenstück des Zaumzeuges etwas zu groß für das Versuchspferd. Dies zeigt, dass Zaumzeuge mit diesem Beschlagtypen individuell für ein bestimmtes Pferd gefertigt worden sein müssen. Die Trense hingegen passte perfekt und wurde vom Versuchspferd sehr gut angenommen. Durch das Gewicht des Eisens war sie jedoch schärfer als eine moderne Trense dieses Typs. BUNSE, L., "Kun et trekkdyr i jordbruket? Hestens betydning i nordnorsk yngre jernalder", Archaeology, vol. MA, Tromsø, University of Tromsø, 2010. EDWARDS, E. H., The complete book of bits and bitting, Newton Abbot, David & Charles, 2004. ØRSNES, M., "Zaumzeugfunde des 1. – 8. Jahrhunderts nach Christus in Mittel- und Nordeuropa", Acta Archaeologica, vol. 64, issue 2, København, John Wiley and Sons, pp. 183-292, 1983. RECH, M., "Pferd und Wagen zwischen Unterelbe und Niederrhein – ein Überblick", Pferdeopfer – Reiterkrieger. Fahren und Reiten durch die Jahrtausende, vol. Beiheft 4/2006, no. Bremer Archäologische Blätter, pp. 1- 61, 2006. RYGH, O., Norske Oldsager, Trondheim, Tapir Forlag, 1885. SUNDKVIST, A., "Rida de döda. Vikingatida bett i Valsgärde och Birka", Archaeology, vol. CD, Uppsala, Uppsala Universitet, 1992.